Rated 3 out of 5 by Ryan D from Accurate and clean but didn’t work well in my G17 I bought this ammo for a GSSF match and tested a box of 50 before the match to ensure proper function. Everything worked as advertised at that time. At the actual match though, I had 3 failures to feed, and took my Glock 17 to the on site certified armorer for inspection. After he confirmed that there was no issue with my G17 and magazines, he recommended switching ammunition. I ended up shooting the rest of the match with my American Eagle 147 grain FMJ backup ammo. The Syntech ammo is a cool concept and when it performs, it does exactly as advertised. Just make sure you field test a bunch of them before you compete to make sure they work well with your gun. Rated 3 out of 5 by Johnathan from Great ammo for most firearms. So I used this ammo for a couple matches and found it to shoot awesome the feel was great flat and soft. I shoot a cz tac sport orange and can say that I had feed failures that no other ammo has ever done like never once. After about 75 rounds they stop cycling perfectly. I luckily took other rounds and saved my competition and they ran 100%. I've shot 147 flat nose un-coated rounds with no problem. For whatever reason the flat nose on these are catching my feed ramp and not pushing forward and chambering. I have friends with non cz's and run perfectly. Anyways it's pretty clean and shoots awesome when it works so as of now I rate it top of the line untill I can find the actual problem. I'll update when I know but if your shooting cz stay away. Rated 4 out of 5 by Frank S from Excellent Ammo But Pricey !!! Shoots soft and is accurate. I really like this ammo but it is waaay to expensive. If the price comes down I think a lot of shooters will stop reloading and use this. But until the price comes down, I'll keep reloading my 147Gr with N320. Too bad cuz I really like this ammo. Rated 5 out of 5 by AlexS from Checks all the right boxes I switched to exclusively shooting Syntech 150 grain for my 2018 major matches, and have no intention of looking back. Out of my Automatic Accuracy Shadow 2s, this ammo is boringly accurate, notably clean, reliable, and precisely meets 135 power factor. 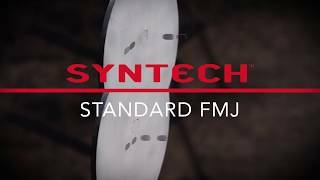 I spend too much time, money, and effort on this sport to worry about ammo issues; with Syntech, I don't have to. Rated 5 out of 5 by Khutch1224 from New favorite Very soft felt recoil when using this round. No Malfunctions of any kind through about 2k rounds. Rated 3 out of 5 by Steve sola from Best ammo, but jams I have purchased 2000 rds of 150 gr Syntech 9 mm for my CZ SP01 USPSA competition pistol. It has the best feel, softest recoil i have ever experienced. But my pistol experiences one jam on feed per 200 rds fired. No other quality ammo jams my pistol. The coating cuts into my feedslide and stops the feed. Each jammed round has a torn Syntech coating where it bit into my barrel feed guide. Hope this coating issue is corrected because this is the only ammo i want to use. Rated 5 out of 5 by XDM Mike from Factory vs Reloading I wanted to try this ammo as an alternative to reloading. I shoot USPSA and Steel Challenge matches. I tested this ammo in 12 different firearms for ability to make power factor, consistency and accuracy. I pulled 10 bullets to verify their weight. The average of those 10 came to 149.9 gr. Velocities, Extreme Spreads, Standard Deviations and Power Factors are as follows: FIREARM	AVG VEL FPS	ES	SD	PF SPRINGFIELD XDS 3.3"	832 7	3	124.716 SPRINGFIELD XDM 3.3"	863	11	4	129.363 SPRINGFIELD XDM OSP 4.5"	880 8	3 131.912 SPRINGFIELD XD TACTICAL 5.0"	888 13	5	133.111 SPRINGFIELD XDM 5.25"	891	11	3	133.560 GLOCK 19 4.0"	863	9	3	129.363 SIG P320 4.0"	836	16	6	125.316 TANFOGLIO STOCK 2 4.5"	881	17	6	132.061 SIG MPX 14.0"	941	35	13	141.055 JP RIFLES AR9 16.0"	923	32	11 138.357 KELTEC SUB 2K 16.0"	975	16	5	146.152 COLT AR15 9MM 16.0"	975	10	4	146.152 As you can see by the chart all except the XDS make power factor. Groups were recorded although me 50+ year old eyes do not like iron sights any longer. I will say all the optic fitted firearms recorded 1" or better groups at 15 yds, including the XDM OSP. The ammo feels soft while shooting and follow-up shots are quick. I normally shoot 125 gr polymer coated reloads and the 150 gr feels less snappy. Next is the cost difference. I purchase my components in bulk so I try to be cost effective. I usually can reload at $0.13 a round, not including the cost of cleaning media and time at the press. I use a Dillon 550 so it goes quick. Depending on where you shop this ammo can be purchased at or less than the cost of reloading. I hope they can keep the price down and the public creates enough demand for Federal to keep selling this product.